Author Of "The Junior Cup," "Sir Marrok," Etc. "It was Rolf in his weapons"
From thirty to sixty years ago appeared the greater number of the English translations of the Icelandic sagas. Since then the reading of these heroic tales has so completely gone out of style that their names are rarely mentioned in schools or even colleges. What boy feels his blood stir at the mention of Grettir? How many lovers of good reading know that the most human of all epics lie untouched on the shelves of the public libraries? The wisdom of Njal, the chivalry of Gunnar, the villainy of Mord, the manhood of Kari, the savagery of Viga-Glum, the craft of Snorri, and the fine qualities of Biarni, of Biorn, of Skarphedinn, of Illugi, of Kolskegg, of Hrut, of Blundketil—all these are forgotten in the curious turn of taste which has made the stories of a wonderful people almost a lost literature. For the Icelanders were a wonderful people. To escape the tyranny of kings they settled a new land, and there built up the laws and customs in which we see the promise of modern civilization. Few early peoples had such a body of laws; few developed such manhood. No better pictures of a law-abiding, rural, and yet valiant race have ever been made than in the tales which the Icelanders had the skill to weave about their heroes, those men who, at home in their island, or so far abroad as Constantinople, made the name of Icelander respected. We read of these men and this people in stories which, somewhat too "old" for boys and girls, reveal the laws, customs, habits of a thousand years ago. The Njal's Saga, the Grettir's Saga, the Ere-Dwellers' Saga, and the Gisli's Saga are perhaps the greatest of those which have been translated. They are reinforced by such shorter pieces as Hen Thorir's Saga, and the Stories of the Banded Men, the Heath-Slayings, Hraffnkell Frey's Priest, and Howard the Halt. The spirit of those days is particularly well given in that wonderful fragment of Thorstein Staffsmitten which (not being part of any complete saga) has been drawn upon for the closing incidents of the present story. Many other such incidents are preserved, a reference to one of which (in a footnote to—I think—the Ere-Dwellers' Saga) gave the suggestion for the main plot of this book. At the same time, in contemporary writings, we may read of the life of other divisions of the Scandinavian race; the story nearest to this book is the Orkneyingers' Saga. The main interest of all these tales is the same: they tell of real men and women in real circumstances, and show them human in spite of the legends which have grown about them. The sagas reveal the characteristics of our branch of the Aryan race, especially the personal courage which is so superior to that of the Greek and Latin races, and which makes the Teutonic epics (whether the Niebelungen Lied, the Morte Darthur, or the Njala) much more inspiring than the Iliad, the Odyssey, or the Aeneid. The prominence of law in almost every one of the Icelandic sagas has been preserved in the following story; and the conditions of life, whether at home or abroad, have been described as closely as was possible within the limits of the simple narrative form which the sagas customarily employed. "'Now Einar Dies If My Father Is Hurt'"
"So Tall Was She That The Vikings Could Not Board Her"
"There He Sat As If He Were Still Alive, But There Was No Sight In His Eyes"
"Grani Took His Sword And His Shield, And They Stood Up To Fight By The Spring"
In the time after Iceland had become Christian, and after the burning of Njal, but before the deaths of Snorri the Priest and Grettir the Outlaw, there lived at Cragness above Broadfirth a man named Hiarandi, called the Unlucky. And well was he so named, for he got a poor inheritance from his father, but he left a poorer to his son. Now the farm of Cragness was a fertile fell, standing above the land round about, and girt with crags. Below lay Broadfirth, great and wide, and Cragness jutted out into it, a danger to ships. It had no harbor, but a little cove among the rocks, where Hiarandi kept his boat; and many ships were wrecked on the headland, bringing fortune to the owners of Cragness, both in goods and firewood. And all the land about once belonged to the farm. Rich, therefore, would have been the dwellers at Cragness, but for the doings of Hiarandi's father. He would always be striving at the law, and he was of ill judgment or ill luck, for what he gained at the farm he always lost. The older he grew, the more quarrelsome he became; and judgments heaped heavy on him, until at last he was so hard put that he must sell all his outlying lands. So the farm, from a wide estate, became only the land of Cragness itself, and another holding of a few acres, lying inland on the uplands, within sight of Cragness and the sea. In the time when Hiarandi was young, Iceland was still heathen. He sought his fortune in a trading voyage, and sailed West-over-the-Sea, trading in the South Isles as a chapman, trafficking in goods of all kinds. And he made money there, so that at last when he sailed again for home he counted on a fair future. But the ship was wrecked in a storm, and few of the men came ashore; and Hiarandi himself was saved by means of a maid who dwelt at the place, who dragged him from the surf. So Hiarandi came home on foot, his clothes in tatters, having lost money rather than gained it. Then his father, whose losses pressed heavy on him, struggled no more with the world, but went to his bed and died. And in that summer when all Iceland took to the new faith, Hiarandi became master at Cragness. Hiarandi was a silent man, not neighborly, but hard-working. An unworldly choice he made of a wife, for he took that woman who had saved him from the waves; she was the daughter of a small farmer and brought neither dowry nor kinship of any power. So men said that Hiarandi had no wish to rise in the world. He lived upon his farm, with two thralls and a bondservant; and husbanding his goods well, by little and little he made money which he put out at call, and so bade fair to do better than his father, for all his poor start in life. And a loving spouse he had in Asdis, his wife, who one day bore him a son. They named the lad Rolf, and he grew to be well knit; he was not powerful, but straight and supple, and of great craft in his hands. And from delight in the boy Hiarandi changed his ways, and became more gay, going to fairs and meetings for the sake of Rolf. And Hiarandi taught the lad all he knew of weapon-craft, which was not a little. The lad was swift of foot; he was skilled in the use of the sword and javelin, but most he delighted in the use of the bow. And that was natural, for upon the cliffs sea-birds lived in thousands, hard to catch. The boy went down to their nests with ropes, and took eggs in their season, or the young before they could fly, and both for food. So skilled was he in this that he was called Craggeir, the Cragsman; and no man could surpass him, whether in daring or skill. But there were times when there were no eggs nor fledglings, and from his earliest boyhood Rolf practised in shooting with his bow at the birds, and he kept the larder ever full. Happy was Hiarandi watching his son, and his pride in him was great. As the lad grew stronger, the father made for him stronger bows and heavier arrows, until at the age of fourteen Rolf used the bow of a man. Then one winter they went down together into the valley, father and son, and watched the sports and games on the frozen mere. There the men of the place played at ball, and great was the laughter or deep was the feeling. Now Hiarandi would not let Rolf play, for often matters came to blows, and he would not have his son maimed. But when it came to shooting with the bow, Hiarandi put Rolf forward, and it was seen who was the best at that play. 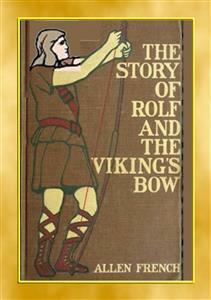 For though the men shot, Rolf surpassed them all, not in distance but in skill. He hit the smallest mark at the greatest distance; and when Hiarandi brought a pigeon and freed it, then Rolf brought it down. No one there had seen such shooting. Then those who were not envious named the lad Rolf the Bowman. But a man named Einar stood by, and he lived on the land which Hiarandi's father had sold. He was rich but covetous, and fond of show, and fond of praise. There lived with him one named Ondott, an Eastfirther who had left his district and come west, a man without property. He stood with Einar and watched the games. "See," said Einar, "how proud is Hiarandi of his son!" "Thou hast a son as well," said Ondott. "How he will shine among these churls when he returns from his fostering in the South Isles!" "Aye," answered Einar. "Like an Earl will he be, and no farmer of these parts will compare with him." "And as for the shooting of this lad," remarked Ondott, "it is not so fine after all." "In the Orkneys," said Einar aloud, so that others should hear him, "they are better bowmen than here, and the Earl will have my son taught everything." Now some who stood by brought Hiarandi this tale. "Have a care," said they. "Thy neighbor Einar sets himself above thee." "Then he must set himself high," answered Hiarandi with a laugh, "for his land lies far lower than mine." Then others carried that tale to Einar, and he laid it up in his mind; but Hiarandi forgot all that had been said, nor did he remember to tell of it to Asdis when they had returned from the games. Then the winter passed on with severe storms, and ships were wrecked on Cragness rocks, but no men reached shore. And Einar envied the more the riches that came to Hiarandi from the wrecks, in firewood, timber, and merchandise. And once a whale came ashore, and that was great fortune. But one evening, as those at Cragness sat within the hall, Asdis came and stood beside her husband, and said, "Listen to the wind." "There is no need to listen," said Hiarandi. "The wind howls for a storm, and this night will be bad." Then Thurid the bondservant, who sat by the fire, looked up and said, "Ships are off the land." "Hearest thou that?" asked Asdis in a low voice. "The woman is strange, but she forecasts well." "Aye," answered Hiarandi, "it is likely that ships will be on the rocks by morning. "Now," asked Asdis, "dost thou remember the time thou camest ashore, these many years ago?" "How should I forget it?" responded Hiarandi. "But no one can rush into the water here," said Asdis, "to save those who are wrecked." "That is true," quoth Hiarandi. "I am sorry for the mariners, yet how is one to help?" Which brings good to thee." After that she sat silent and sunken as before. "Hear the hag," said Asdis, shuddering. "But we prosper through the misfortunes of others." "What is to be done?" asked Hiarandi. "It is in my mind," said Asdis, "that if we made a fire-beacon, people could steer from shore and so into safe harbor farther up the firth." "Now," quoth Hiarandi, "that might be done." "Wilt thou do it?" asked Asdis. How then butter thy bread?" Then Hiarandi said to Asdis: "No man has ever yet set beacons against shipwreck. All men agree to take the fortune of the sea; and what is cast on a man's beaches, that is his by old custom." "Thinkest thou that is right?" asked Asdis. "Moreover," went on Hiarandi, "the sea is but giving me again what it took away." "Never can the sea," answered Asdis, "give thee true happiness through other men's misfortunes." "Remember the boy," said Hiarandi. "Shall I leave him with nothing to begin the world with? For my own earnings bring me at most a mark of silver in the year." "For all that," replied Asdis, "it is in my mind that to do otherwise were to do better. Now canst thou have the heart that men should die longer on our rocks, and we not do our best to save them?" "Take what is given.No man is wiseWho asketh twiceIf earth or heavenSends him his prize." "Suffer not wrongTo happen long,Lest punishmentFrom heaven be sent." Now in Iceland all men loved the singing of skalds; but though Hiarandi had heard the carline sing many times before, never had he heard rhymes from his wife. So he stood astonished. "Ill will attendThe beacon's lighting.Bad spirit's guidingWill bring false friend." "Let God decideWhat fate shall rideUpon the wind.Be thou not blindTo duty's hest.My rede is best.List to the storm!Go! Save from harmThe marinerWhose fate is near.To others doAs I did once to you." And it seemed to Hiarandi as if she commanded him. Moreover, as he listened, the storm roared louder. Then he seized his cloak, and cried to his thralls, "Up, and out with me to make a beacon!" Though they dared not disobey, they grumbled, and they got their cloaks slowly. For they saw slipping away from them the fine pickings from the wreck, which brought them warm clothes and handsome. Out they went with Hiarandi into the storm, and kindled a great fire at the edge of the cliff. And Rolf toiled too; but Asdis did best of all, for she brought out in a kettle great strips of whale's blubber, and flung them on the fire. Then the flames flared high and wide, as bright as day. And Rolf sprang to the edge of the cliffs and gazed upon the water. Then, pointing, he cried, "Look!" Down below was a ship; its sail flapped in rags, and the crew were laboring mightily at the oars to save themselves, looking with dread at the white breakers and the looming rocks. Now in the strength of their fear they held the vessel where she was; and by the broad light of the fire every man of them was visible to the Cragness-dwellers. To Rolf that was a dreadful sight. But the bit of a sail was set, and men ran to the steering-oar to hold the vessel stiff; and behold, she moved forward, staggered past the rocks, made clearer water, and wore slowly out into the firth. Even the thralls shouted at the sight. Then Hiarandi left one of the thralls to keep the fire, and went back to the hall with those others. There the carline still sat. "So he is safe past the rocks?" she asked, yet speaking as if she knew. "Now," said she, "thou hast brought thy evil fortune on thyself, and it will be hard to avoid the extreme of it." "I care not," answered Hiarandi, "even though I suffer for a good deed." "Nevertheless," said the carline, "the future may be safe, though without riches, if thou wilt be guided by me. Wilt thou follow my redes?" "No advices of thine do I follow," replied Hiarandi. "For methinks thou still servest the old gods, and canst work witchcraft. Speak no more of this matter in my house; and practise not thy sorcery before my eyes, for the law gives death as punishment." "Now," answered the woman, "like a foolish man, thou rushest on thy fate. And I see clearly that thou art not he who was spoken of in the prophecy. Not a fortunate Soursop art thou." "Since the slaying of Kol, who put the curse on all our stock," answered Hiarandi, "has but one of the Soursops prospered. How then should I be fortunate?" "Two were to prosper," the woman replied. "And each was to put an end to the curse in his branch of thy race. Snorri the Priest is one of those two, as all men know. But thou art not the other; and I believe that thou art doomed to fail, even as thy father was." "So I have long believed," said Hiarandi calmly. Then the carline rose, and her eyes were strange, as if they saw beyond that upon which she looked. "More misfortune is coming than thou deemest," she said. "Outlawry. Mayhap even death. Be warned!" "Thou art a heathen and a witch," said her master. "Be still!" But she said: "I will not abide the curse. Hiarandi, I have worked long in thy house. Give me now my freedom and let me go." "Thou hast long been free to go," he replied. "Take thy croaking to another man's board! But this little prophecy I give to thee, that no man will believe thine ill-speaking." "No great foresight hast thou in that," she answered. "Never have I been believed." Then she drew on her cloak and hooded her face. "Thou wilt not go in the storm?" asked Asdis. "All times are alike," the woman said. "Heed thou this, Hiarandi. Beware the man who came in the ship thou didst save!" "He is one," answered Hiarandi, "whom I fear not at all." "Beware suits at law," said the carline again, and she turned to go. "It needs no great wisdom to say that," retorted Hiarandi upon her. "But stay! I send not people from my door penniless. Nothing is owing from me to thee, yet I will give a piece of money." "Soon," answered Thurid, "thou wilt need all thou hast." And she went out into the night. Of those things which had been said, Rolf heard all, yet he had not spoken. Now he drew near to his father, and said to him: "Explain to me, father, the things of which the woman spoke. What is the curse upon us, and can such a thing be true?" Then Hiarandi answered: "Thou knowest we are of the Soursops, who got their name when they sopped with sour whey the fire which was kindled to burn them in their house. Now Gisli, the first of us, slew Kol, his wife's foster-father, for the sake of his sword Graysteel, and Kol laid the curse of misfortune on us. Slayings arose by means of that sword; there came the outlawing of Gisli, the grandson of the first Gisli, and death fell in most branches of the house. Fourteen years Gisli was outlaw, even as has been, to this year, Grettir the Strong, who is the great outlaw of our day. But Gisli was slain, and his brother, while his sister died. Son of that sister is Snorri the Priest, who alone of us has prospered; for though no slayings have ever happened in our branch, unlucky are we all, as is plain to see." "I have often wondered," said Rolf, "how it is that we live here in this great hall and have but us three and the servants to fill it. There are places for seven fires down the middle of the hall, yet we use but one. And all the benches were once used, since they are worn: seats for fifty men, and the women's seats besides." "Once," said Hiarandi, "my father had so many on his farm that nightly the hall was full. But those serving-men are Einar's now, and all our riches have passed away to him. Yet this house is the finest in all these parts. I was at the building of it in my youth, and" (here he made sure that the thrall was not listening) "I myself made the secret panels by which we can escape in case of burning. For since that burning so long ago, no Soursop builds himself a house in which men may trap him." "But thou hast no enemies, father?" asked the lad. "No enemies, I hope," answered Hiarandi, "but few friends, I am sure, since only Frodi the Smith, my mother's cousin, is of our kin; for I count not Snorri the Priest." "But why not Snorri the Priest?" asked Rolf. "My father," answered Hiarandi, "quarrelled with him and called him coward. For Snorri would not take up at arms a suit my father lost at law." Then Rolf thought awhile. All men knew of Snorri the Priest, who was no temple priest at all but a priest of the law. For the title had come down from heathen times, when leaders had sway over all matters, both in religion and law, and to be priest was to be chieftain. But usage and the new religion changed that by degrees; so that to be priest now meant to be a giver of the law, with a seat at the Quarter Courts and at the Althing, the great yearly gathering to which from all Iceland men went to settle suits. And Snorri the Priest was well known as the richest man in Broadfirth dales, the shrewdest and wisest in all things worldly, and a master at the law. "It would be well," said the lad, "to have Snorri on our side." "It is better," said Asdis, "never to go to the law. Lawsuits and quarrels are bad things, and they bring a man's fortune to naught." And Hiarandi added, "By law we have ever suffered." Then Rolf was silent, and thought of what had been said: how the old woman had prophesied trouble at the law, and by what man that trouble should come. And as he thought upon the words she and his father had spoken, he thought that they had spoken with knowledge, though of different kinds: for while the woman prophesied vaguely, his father had seemed to know who the man should be. "Father," asked Rolf, "knowest thou who the man is that came upon the ship?" Asdis asked: "Who then is he?" Hiarandi said: "Saw ye upon the ship, as it lay below us, the faces of any of the men?" "Aye," answered they both, "for it was as clear as day." "Saw ye then," asked Hiarandi, "one who stood by the mast, a tall man with a great beard?" "I saw him," answered Rolf. "He stood and held by a rope and the mast, and I thought he should be the captain; but he gave no commands, nor did any man heed him, for all worked of themselves." "Yet, as I guess," said Hiarandi, "the captain was he, and he was the man of whom the carline spoke." "Who is he, then?" asked the boy. "Listen," said Hiarandi, "and I will tell thee of one in my family of whom I have never yet spoken. There were two of us when I was a lad, brothers; and the other was named Kiartan. He was younger than I by a year, and different in all his ways; yet I have often thought that my father had not enough patience with him. For he sent him to bad companions rather than weaned him from them, and at last he drove him from the house altogether. Then Kiartan took to the sea—he was not bad, remember, but weak perhaps and foolish—took to the sea, and we saw him not for years. Once only he came back, out at elbow, and asked my father for money. Money he got, but gave the promise to ask nothing from the inheritance; and this was handselled before witnesses, my father giving much, the rest to come to me. Then Kiartan went away again, and not until this night have I seen him. But if that was his ship, then he has prospered." "Yet it was he the woman meant?" asked Rolf. "Who else?" returned his father. "How should he," asked the boy, "bring trouble on thee?" "I see not," answered Hiarandi, "how he should bring either evil or good." Then he closed his mouth and became thoughtful, in a manner he had. Asdis motioned Rolf to be silent, and nothing more was said in the matter. On the morning of the fifth day thereafter, as Rolf stood by the gate of the enclosure which protected the farm buildings, he saw a man coming on a horse, and knew him for his father's brother Kiartan. He was a big man, heavily bearded, dressed in bright-colored clothes and hung about with gold chains. His eye was bright and roving; his face was genial, and he looked about him as he came as one who is well contented. Yet Rolf liked him not. Now Kiartan rode up to the enclosure and saw the boy. "Ho!" he cried, "come hold my horse and stable him." So Rolf took the horse by the bridle and held him while the man dismounted. Then the boy started to lead the beast to the stable. "Where is thy mistress?" asked Kiartan. "My mother is in the house," answered Rolf. "Now," Kiartan cried, "I took thee for a stable-boy. But thy father had ever a love of the earth, and so perhaps hast thou. Knowest thou me?" "Thou art my uncle," replied the lad. "Now," cried Kiartan, staring, "what spirit told thee of me?" "Five nights ago," answered Rolf, "thou stoodst below on the deck of thy ship, and lookedst up at Cragness. And our beacon saved thee." "Aye," said Kiartan. "We had work to save our lives, and a close miss we made of the Tusks." But he never gave a word of thanks, either to Rolf or to Hiarandi, for the saving of his life. "Thou art wise to stay at home, boy; for see how a sailor's life hangs ever on a thread. Now stable the horse, and I will see thy mother. The farmer is likely in the field." So Rolf stabled the horse, and called his father from his work; and Hiarandi came, muttering (though he meant not that Rolf should hear), "Poor steel comes often home for a new edge." But he greeted his brother well, and bade him stay with them for the winter. "Even for that am I come," answered Kiartan. "For my cargo is already sold, and my ship laid up for the winter near Hvamm, and I come home to my kinsman. No poor penny am I this time, to need any man's help. Perhaps," and he looked about him, "I can even help thee." But the buildings were neat and weather-tight, and the farm was in no need of improvement. "I need nothing," said Hiarandi, "and I even have money out at call there in the neighborhood where thy ship is laid. But come, the wife prepares the meal. Lay aside thy cloak and be at home." And so Kiartan entered on his wintering at Cragness. Quiet is the winter in Iceland, when men have no work to do in the field, save the watching of horses and the feeding of the sheep and kine. Weatherwise must a man be to prepare against the storms, which sweep with suddenness from off the water and enfold the land with snow. Yet Hiarandi's flocks were small, and his sheep-range was not wide, and both he and Rolf were keen to see the changes in the weather; and as for their horses, they stayed ever near the buildings. So all were free to go to the gatherings which men made for games and ball-play, in times of fair weather. Thither Kiartan loved to go, dressed in his fine clothes, and talking much. But nights when he sat at home he would speak of his travels, and what a fine place the world was, and how little there was for a man here in Iceland. He said it was nothing to be a farmer, but a great thing to rove the sea, and to live, not in this land where all were equal, but where there were kings, earls, and other great men. Once as he spoke thus he provoked Hiarandi to words. "Meseems, brother," the farmer said, "that thou hast forgotten the way our forefathers thought. For it was to avoid kings and earls that they left their lands in Norway and came over the sea hither. And those whom thou prizest so high are so little thought of here that we make nothing of them whatever." "Now," answered Kiartan, "thy neighbor Einar thinks well of earls, for he has fostered his son with the Earl of the Orkneys." "The lad will understand little of our ways when he returns," replied Hiarandi. "For all that," Kiartan said, "I name the son of Einar luckier than thy son here. A great court is held in the Orkneys, and all matters are to be learned there." Then Hiarandi made response: "No court can teach good sense to a dolt, and no wisdom will flourish unless there be good ground for it to sprout. I have seen wise men bred in this little land, and fools that came out of Norway." Then Kiartan talked not so much before Hiarandi of the things he had seen, nor for a time before Rolf either. But when there came again the great winter ball-play, to which all went, and Rolf shot again with the bow before them all, and proved himself the most skilful, though not yet the strongest: after that Kiartan made more of the lad. "Men," said he to Rolf one day when they were alone, "may be able to shoot farther than thou with the bow, for two did it. But none shot so surely. And some day thou wilt outshoot them as well." "I think not much of it," answered Rolf. "Now," said Kiartan, "thou shouldst learn to prize thyself higher. For in the Orkneys good archers are welcome in the Earl's body-guard, and a man is honored and well paid." "Yet he is no longer his own man," answered Rolf. "What of that?" asked Kiartan. "If for a few years he can see the world, and make his fortune also, then he is forever after a greater man at home. Think more of thyself!" And at other times he spoke in the same strain, bidding Rolf value himself higher. And he told of the great world, and described his journeys. For he had been, he said, as far as the great Middle Sea, had traded in Italy, and had even seen Rome. And Rolf was greatly interested in those tales; for the lands across the sea were of moment to all Icelanders, since many a man fared abroad often, and no man thought himself complete who had not once made the voyage. So he listened willingly, when Kiartan told his tales at evening in the hall. The parents were inattentive; but sometimes Hiarandi, and sometimes Asdis, would interrupt the story, sending the lad to some task or to bed. "Brother, thou knowest I must go away to-morrow." "Now," said Kiartan, "let me say to thee what is in my mind. Take it not ill that I speak freely. But I think it wrong of thee that thou keepest here at home such a fine lad as is Rolf thy son." And he would have put his hand upon the boy's shoulder, but Rolf drew away. Kiartan went on: "Now I am going to the South Isles. Send Rolf with me, and let him see the world." Then Hiarandi grew uneasy, and he answered: "Speak no more of this. Some day he shall see the lands across the main, but as yet he is too young." "Nay," answered Kiartan, "he is nearly full-grown. What sayest thou, Rolf? Wilt thou not go with me?" Rolf answered: "I will be ruled by my father." "I have made much money," reasoned Kiartan, "and thou canst do the same." "I care not for trading," replied Rolf. "There are courts to be seen," said Kiartan, "and thou mayest serve in them thyself." "I am not ready to be a servant," quoth Rolf. "But thou mayest see wars and fighting," cried Kiartan. "I have no quarrels of my own," answered the boy, "and I mix not in the affairs of others." Now Hiarandi and Asdis had listened with both anger and fear,—anger that Kiartan should so tempt the boy, and fear at what Rolf might answer. But Rolf spoke with wisdom beyond his years; and at his last response Hiarandi smiled, and Asdis clapped her hands. Then Kiartan started from his seat and cried: "Out upon ye all for stay-at-homes!" And he would speak no more with them that night, but went to his locked bed and shut himself in. Yet he spoke to the lad once more in the morning, out by the byre while Rolf was saddling the horse.